Jon Myers Search Blog: Jon Myers....who are we??? 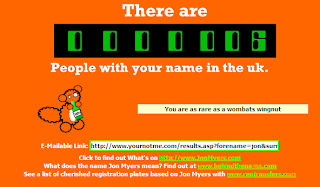 Well I was having a play with a site called http://www.yournotme.com which is basically a website where you can find out how many other people with your name there are in the UK. It was great to see that there are only 6 of us....as in 'Jon Myers'. There are 338 John Myers so that 'H' makes you a whole lot more common (no offense intended as we are all Jon Myers together!). So I am thinking it would be good to try and find the other 5 Jon Myers here in the UK and try and see if they have blogs which means we could create a blogging group for Jon Myers named people. Watch this space and I will let you know how I am getting on.....THE SEARCH COMMENCES!